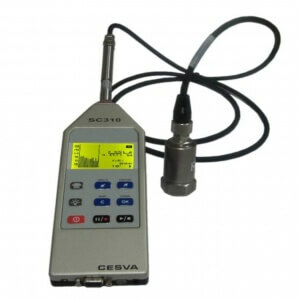 The module for vibration measurements of the SC310 sound level meter adds 2 measurement modes: human exposure to whole-body vibration in buildings mode and Fast Fourier Transform (FFT) narrow-band frequency analysis for vibration. The human exposure to whole-body vibration in buildings mode of the SC310 includes a new mode for measuring structural vibration to which human beings are exposed in buildings. This new mode VIBRATION has been designed according to ISO 2631-2:2003 and along with the preamplifier PA001 and the accelerometer converts the SC310 into a human vibration-measuring instrument according to ISO 8041. (The module for vibration measurements does not include accelerometer). This new mode consists of 3 screens. The first one shows a 1/3-octave band real-time spectral analysis from 1 Hz to 80 Hz, showing the acceleration information in linear [m/s2] and logarithmic numerical values [dB referred to 10-6 m/s2]. The second one shows this spectral information in graphic format and also gives the evaluation of the multiplying factor K according to the old ISO 2631-2:1989. The third screen shows linear and logarithmic overall values of acceleration evaluation parameters such as aWm, peak, crest factor, MTVV (Maximum Transient Vibration Value) and VDV (Vibration Dose Value). All these parameters with Wm frequency weighting (ISO 2631-2:2003).